1890 begins much like the previous year with Vincent van Gogh making various recoveries and breakdowns. As before, van Gogh continues to work when he can and, as his life draws to a close, his paintings gain more and more recognition. On 31 January Theo's wife, Jo, gives birth to a son who they name Vincent Willhem. After a serious attack in February lasting two months, it's decided that van Gogh should move closer to Theo and be put under the care of Dr. Paul Gachet. Vincent van Gogh takes a drastic turn for the better during the course of this move and arrives in Paris looking fit and well (in fact, even more fit than his brother who had been suffering from ill health for years). 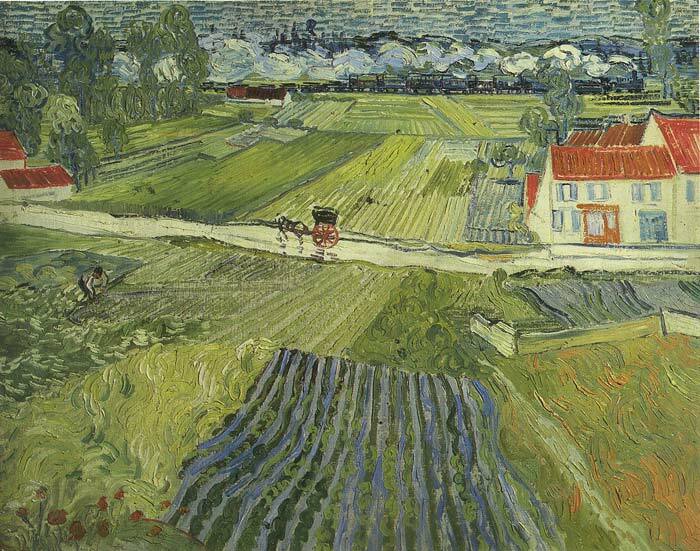 In May van Gogh moves to Auvers-sur-Oise, just north of Paris and, while under the care of Dr. Gachet, begins to paint with incredible energy, producing more than 80 paintings in the last two months remaining to him. SPECIAL NOTE : The painter will make the reproduction as close to the original oil painting as possible. If you want your painting to alter from this likeness, please email us and " After the Rain, 1890 " will be reproduced according to your special requirements.